SpaceAgeSage » Blog Archive » Your kind of neighborhood … or not? “You know, it would be horrible living with Christ, Buddha, Martin Luther King, Jr., Mother Teresa, and Gandhi as my neighbors,” a friend once told m e.
Why would having the best examples in history as neighbors be a negative? Couldn’t he see that these people would be the most forgiving, loving, and understanding? Why did he fear their reputations, when they were known for doing no harm, but only good? I couldn’t believe it. Instead of seeing the situation as an opportunity, he saw it as a burden. He feared having to make changes in himself. He feared expectations he perceived as too much to bear. He feared he couldn’t be what he perceived as superhuman. Would such neighbors bother you? Do you avoid playing it small? I have to agree with Marelisa on this one. To be surrounded by that wisdom, to have – that near – such spiritually guided people – would be such a powerful experience. And, from what I know of all of these great people, they were not “above” others, but amongst them. I totally would want to live next door to Mother Teresa. She inspired so many people in India – I can only imagine what I’d have learnt from her if I lived next door to her! There is so much greatness in the world – and what good is it if we do not learn from it ? I try to do and be my best every day and I see no reason to be ashamed. I agree with you, Lance, and Maya. I’d love to be around such powerful, yet impacting people. I don’t think I’d like trying to outdo them in some areas, though — for example, being on a water polo team against Christ’s team — but it would be interesting! “And, from what I know of all of these great people, they were not “above” others, but amongst them.” — I so agree with that, Lance, and will challenge readers to be the same in future posts. Arrogance, hypocrisy, and living or ruling by fear have no place in a spiritually fulfilled life. “I try to do and be my best every day and I see no reason to be ashamed.” — So nice to hear such a healthy perspective! Shame, insecurity, and guilt don’t help build us up too much, do they? I can see how being next to someone “perfect” all the time would be discouraging, but I can also see how it could be inspiring. I guess it really is up to us. I hope that I can provoke some serious discussion here. No, such neighbors would not bother me. On the contrary, they may find it difficult to live as my neighbor! This is certainly a possibility as quite how any one of them would look at my life style and value system is a surmise at best. Each example given is famous, but their psychological profiling can be revealing. I know they all had their bad days, but that’s when the rubber meets the road regarding character. Insecurity makes me feel intimidated by mental powerhouses, but real spiritual powerhouses make me feel accepted and loved. I think they would have dealt with enough difficult people in their lives that most of us would come across as pretty mild-mannered as neighbors. Very timely, once again! I have a good friend who actually worked with Mother Theresa. He does Great Works. However, we had a bit of a philosophical debate this week. He thinks I should be using my blog to talk discuss social issues. I argued that I was. That I discussed the social issues of day to day life, and all the trials and tribulations associated with being happy and being a better human being. Some very long emails went back and forth, and we are still discussing. It is, of course, going to end up as a post, probably in the New Year. But in direct response to your post, I almost agree with your friend, only in that we put the Mother Theresa’s of the world on a pedestal. Don’t get me wrong. She did incredible things. Things I am not willing to do myself. BUT does that make me a lesser person for tackling little things, like no longer using shampoo so less chemicals are going down the drain? 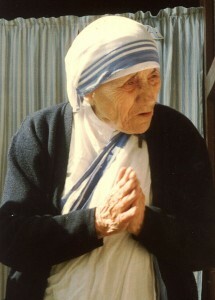 I don’t believe it does, but it would look awfully darn trivial if Mother Theresa was my neighbour. Interestingly, my friend quit working for Mother Theresa because she refused to address issues globally. She was helping one person at a time, but my friend thought she should be fighting to globally stamp out poverty. Whose approach is better? This is the type of thing I will explore in more depth in my upcoming post, but I think we need my approach, my friend’s approach AND Mother Theresa’s. I’m not fond of those who push too hard for me to jump on their agenda bandwagons. I sometimes prefer the power of one and that our stories, our lives, our relationships are where transformation happens. Some of us work best pointing our power into the global arena; some of us work more powerfully in our own neighborhoods. I put a lot of energy into caregiving my mom, but becoming an eldercare advocate holds no passion for me. It is however, Linda Abbit’s passion, and she does it well at http://tenderlovingeldercare.com. If I tried to do what she does, I would burn out, and then what help would I be? My point to my friend exactly. We have to follow our passions. And if those passions make the world a better place, then it shouldn’t matter if it is a global policy change or a smile on someone’s face. Hi Lori. It would be an awakening to have one of these gurus live next door. At first I was comforted by the realization that they would accept my shortcomings, but after thinking about that, I would want to be challenged to move past them. So in that respect it would be good to “see” their model and choose how to build my own. Genuine leaders create leaders by example, support, and nurturing, so you’d definitely have the booster rockets around you to blast off in your unique direction. The discussion on this thread is fantastic. I would love to have inspirational people like ML King, Gandhi and Mother Teresa as neighbours. I like to surround myself with people who are passionate about something and I admire greatly people who feel the pull to sacrifice so much in life for a greater purpose. Once I truly felt like UP’s friend that you always had to go for the greatest impact, but the past couple of years I ahave finally become comfortable with the thought that we must all do what is in line with our purpose and we are all not meant to be as selfless as Mother Teresa. But that does not mean we can’t inspire others with our simple acts of generosity, personal responsibility, heart and spirit. I am all for the think big, act small concept. It’s the most do-able for all of us and it usually reaps the most results. Thanks for the thought provoking post, Lori and I also look forward to UP’s post about this. Nice to see you after your Intruder story! I like the way you put this: “… people who feel the pull to sacrifice so much in life for a greater purpose.” Such energy does change the world, doesn’t it?